LRWC joined the Union Internationale des Avocats, the German Bar Association, the Law Society of England and Wales and Lawyers for Lawyers to object to the wrongful conviction and sentencing of lawyer Wang Quanzhang in China. The NGOs call on China to release him immediately in compliance with China’s international human rights law obligations. The International Association of Lawyers (UIA), the Law Society of England and Wales, Lawyers for Lawyers, the German Bar Association (Deutscher Anwaltverein) and Lawyers’ Rights Watch Canada are extremely concerned about the recent conviction and sentencing of our fellow lawyer Wang Quanzhang. Prior to his arrest, Mr. Wang Quanzhang practiced at the Beijing law firm Fengrui. He worked on cases of torture allegedly committed by the police, cases relating to alleged Falun Gong members, and cases involving land rights. On 28 January 2019, the Tianjin Municipal No.2 Intermediate People’s Court (the “Court”) issued a judgment in which Mr. Wang Quanzhang was found guilty of “subversion of state power” and sentenced to 4 years and six months in prison and a ban on exercising his political rights for a period of 5 years. Mr. Wang was also prohibited from practising as a lawyer. However, we understand that the charge of “subversion of state power” is related solely to Mr. Wang’s legitimate exercise of his professional duties, which is protected under the Constitution of the People’s Republic of China and by international human rights standards. Furthermore, it is alleged that the trial was held behind closed doors because the Court held that the case involved matters relating to “national security”. Restrictions on the right to a fair trial, including the right to have a public hearing, can only be justified in certain limited circumstances. Where there is no reliable or credible evidence to suggest that there is an absolute necessity to hold proceedings behind closed doors, even in cases concerning national security, such restrictions constitute a violation of the right to a fair trial. The Court’s decision to convict Mr. Wang was made only 4 months after the UN Working Group on Arbitrary Detention (UNWGAD) concluded (A/HRC;WGAD/2018/62, 12 October 2018) that Mr. Wang’s detention and deprivation of liberty was arbitrary, since it contravened articles 9, 10, 11 and 19 of the Universal Declaration of Human Rights. The UNWGAD also determined that the appropriate remedy required China to release Mr. Wang immediately and to accord him the right to compensation and other reparations, in accordance with international law. We understand that Mr. Wang was taken into custody by police on 3 August 2015. In addition, we are also aware that his whereabouts were unknown to any third party, including his family, and that he was being held incommunicado for most of the time during a period lasting over three years. In previous communications, our respective organisations have raised our grave concerns about violations of international and domestic standards, which guarantee the right to due process and a fair trial. In Mr Wang’s case, the circumstances and conditions of his arrest, enforced disappearance, and detention, without access to a lawyer of his own choosing or visits by family members, constitute a clear violation of those standards. 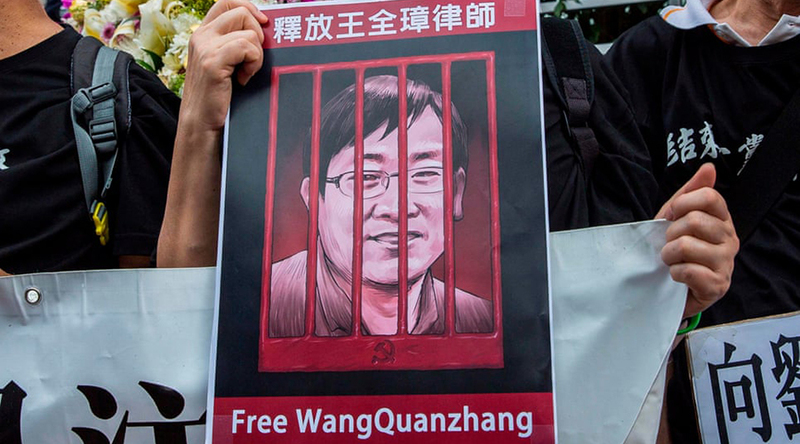 As determined by the UNWGAD, as a result of his arbitrary arrest and his lack of access to legal counsel, for many years, Mr Wang was not in a position to challenge before a court the basis of his arrest and detention. The denial of Mr Wang’s access to a legal representative of his own choosing constitutes a clear violation of principles enshrined in China’s domestic law and international human rights law. We are particularly concerned by reports that authorities have systematically obstructed the work of lawyers appointed by Mr. Wang’s family. Most of these lawyers allegedly faced increasing pressure to drop Mr. Wang’s case, and/or were subject to acts of reprisal for taking up his case, including the revocation of their license to practice or detention. We understand that a lawyer was subsequently unilaterally appointed by State authorities in China to represent Mr. Wang, but that Mr. Wang may have dismissed this lawyer and so it is unclear if he had legal representation during the proceedings in which he was convicted. Moreover, we are alarmed that Mr Wang Quanzhang may have suffered serious mistreatment during his long incommunicado detention and that Mr. Wang’s wife, Li Wenzu, and his child have been denied access to Mr. Wang and subjected to intimidation, surveillance and harassment, allegedly in response to Ms. Li’s efforts to secure Mr. Wang’s release. Our organisations respectfully draw attention to the People’s Republic of China (PRC)’s membership on the United Nations Human Rights Council. As a member, the PRC is expected to uphold the highest standards in the promotion and protection of human rights. Therefore, the PRC’s actions must reflect its international responsibilities and commitments regarding human rights. Mr. Wang’s arbitrary arrest, enforced disappearance, prolonged pre-trial detention, lack of a public trial, lack of access to a lawyer of his own choosing, and mistreatment upon arrest and/or in prison all constitute serious violations of international human rights standards. Cease all forms of harassment, intimidation and/or reprisal, including of a judicial nature, against Mr. Wang and his family. We thank you for your attention to this very serious and urgent matter. We will continue to closely monitor this case and the cases of other members of the legal profession in China. Universal Declaration of Human Rights, Article 3 and Article 9; International Covenant on Civil and Political Rights, Article 9.
 International Convention for the Protection of All Persons from Enforced Disappearance, Article 1. Universal Declaration of Human Rights, Article 11.1 ; International Covenant on Civil and Political Rights, Article 14.3(b); UN Basic Principles on the Role of Lawyers, principle 5. Universal Declaration of Human Rights, Article 5; International Covenant on Civil and Political Rights, Article 7 and Article 10.1; Convention against Torture and Other Cruel, Inhuman or Degrading Treatment or Punishment, Article 2; UN Basic Principles for the Treatment of Prisoners, principle 1; Body of Principles for the Protection of all Persons under any Form of Detention or Imprisonment, principle 1 and 6.